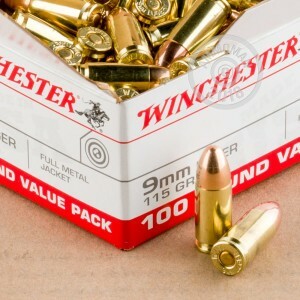 This 9mm Luger ammunition from Winchester delivers excellent range performance for both compact and full size pistols. 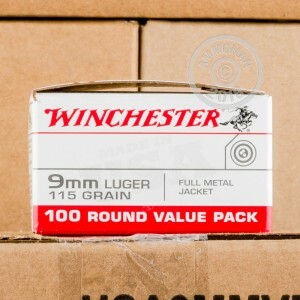 Each cartridge in this value pack of 100 fires a 115 grain full metal jacket bullet at 1,190 feet per second. As standard pressure 9mm Parabellum ammo, these rounds are great for everything from subcompact carry pistols like the M&P Shield and P938 to full size service handguns like the Browning Hi Power and SIG P226. Buy a few of these boxes to get free shipping from AmmoMan.com (applies to all orders over $99). I am running about a 4% MF on this ammo. 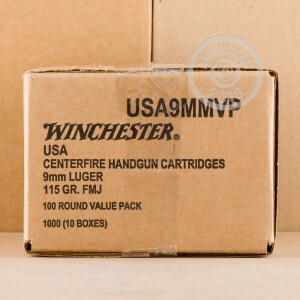 I bought 1000 round package of 100 round per box. Too many other brands to choose from.